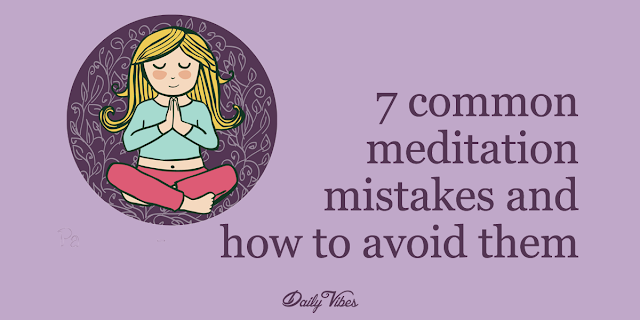 7 Common Meditation Mistakes And How To Avoid Them. We all make mistakes, especially when we’re learning something new. As basic as meditation appears to be, there are mistakes you can make as you’re learning how to do it. Meditation is a wonderful thing to do; it helps you feel calmer and more confident, as well as recognize the importance of each individual moment. These are mistakes to watch for, whether you’re a seasoned meditation expert or a beginner. Many times, people who are new to meditating go into it with a great deal of expectations. They hear the amazing success stories of yogis who have found their form of nirvana or people who’ve cured themselves of various psychological ailments. Going in with a lot of expectations runs parallel to what meditation is all about. Meditation is not necessarily about clearing your mind. Could you imagine having a clear mind? I’ll have a mind void of thoughts when I’m dead and not a moment sooner. If anything, meditation should be geared toward calming your mind, not wiping it of all activity. Be sure to focus on your breathing or a certain type of thought. Meditation works best when you do it routinely. I’m not saying you have to do it for hours every day, but if you’re meditating for 20 minutes in the morning, make sure it’s every morning, or every afternoon, or whenever it is you’re doing it. Make it a thing. 4. Meditating in the closet. You do not have to hide your meditation from anyone. One mistake people make is acting as if meditation is something to be ashamed of and hiding it from the people they love. If you feel like you have to meditate in the closet, you likely won’t stick with it. No, you do not have to sit cross legged with your fingers pinched on your knees. You can meditate however you like. Sitting up, laying down, hanging upside down, sitting at the kitchen table, wherever. It doesn’t matter. It’s easy to leave a meditation session and feel like something went wrong or it just didn’t go like you’d hoped. But consider numbers one and two in this list. You don’t need to level expectations or force anything with your meditation session. Just enjoy it. 7. Overuse of guided meditations. Guided meditations are my favorite, but it shouldn’t be all you do. You should let your mind take the meditation wherever it’s going to go, not necessarily have someone else tell you how to meditate every time.